It’s been almost exactly 1 year since the relaunch of the Nacra 17 to fully foiling. Hordes of the worlds top talents are storming into the class along with ambitious newcomers. The 2018 European Championship will be contested this week from Gdynia from 58 boats, including almost all of the class contenders. 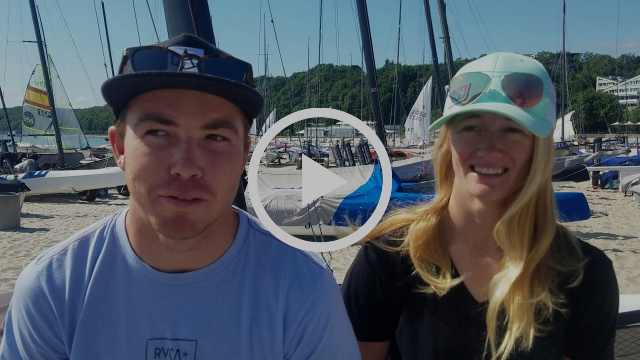 Riley Gibbs and Louisa Chafee (USA) share their thoughts ahead of racing. Treble European Champions Ida Nielsen and Marie Olsen (DEN) are back! Copyright © 2018 9er Inc, All rights reserved. You received this email because you’ve show interest in the 49er and Nacra 17 Classes or other high performance sailing.